Valbyparken, one of the largest parks in Copenhagen has a few surprises. Known to locals, mostly, as the venue for large concerts and one-day festivals, Valbyparken is located a 15 minute bike-ride from the city center. In the park you’ll find playgrounds, people barbecuing and quite a nice collection of roses in the Rose Garden (boasting 12,000 roses). 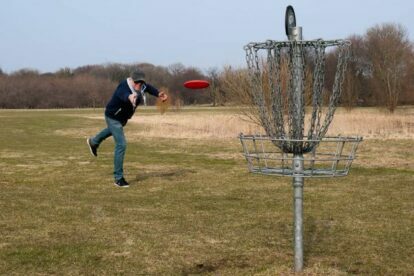 However, my favorite part of Valbyparken and why I go there, is the Disc Golf course. Disc Golf is an – admittedly – odd sport that basically combines golf with Frisbee. Disc Golf allows for both beginners as well as experienced players to play as you can choose to start from the easy (red), middle (yellow) or hard (white) tees. And just like in regular golf, the goal is to get to the target in as few strokes/throws as possible. You throw the disc towards a strange basket on a pole equipped with chains for catching the disc. The Valbyparken course has 18 holes in a varied landscape with both water hazards and small hills. Most holes in Valbyparken are par 3 or par 4. You should expect a round to take about 2 hours. For me, it is one of my favorite ways to spend Saturday afternoon before a night out with friends. The Disc Golf course is free, open all year, but you need to bring your own discs as there is no onsite pro-shop.